Title: BNSF 126 in Thomas yd. Description: 20G heads east through Bethlehem at 8:25AM. Description: 20G splits the 78 signals at 9:47AM after waiting for 21M and 11J. 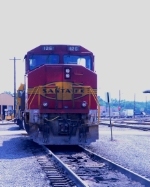 Description: This one still has Santa Fe lettering on the front. Description: Higginsville Road, Readington Township, 1036 hours. Description: BNSF Eastbound Local Freight Train passing through Peach Springs, Az. Description: BNSF Eastbound Local Freight Train passing through Kingman, Az.